Backdated post. 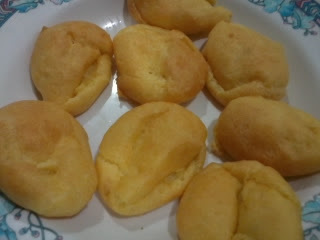 I made this during the weekend as I suddenly craved for cream puffs. Most bakeries are selling cream puffs with whipped cream filling, but I prefer custard filling. And I know one cream puff shop that sells 3 pieces for over RM12++, call me stingy, whatever, but I was stunned at the overpriced puffs with just whipped cream filling. So I decided to make my own. For the puff: 1/4 cup butter, 3/4 cup flour, 125ml water and 2 eggs. Boil water and butter in a saucepan. Once boiling, add in the flour in one go, stir quickly until it forms a clean lump. Remove from stove and cool the lump. Whisk 2 eggs and stir hard. I used a spoon to scoop 1 spoonful onto a baking tray, already lined with parchment paper. 1 spoonful for 1 piece of puff. Bake at 220 degrees for 20 minutes. For the custard filling: 1 tbsp custard powder (I used Bird's Custard), 1 tbsp sugar and 8oz milk. Prepare the custard following instructions on the custard packet. Cool the custard. 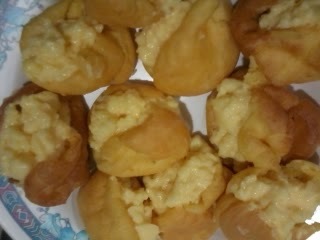 Slit the puffs into two, fill them up with custard using spoon. Hubs and I finished half the puffs on the same day. I put the remaining puffs in the fridge and it still tasted good when I ate them the next day, better, because the custard was cold and melted in my mouth!